A Junior State player did not seem to be volleying and was adamant that no volleys had presented themselves. So, as the Coach I said, "take the player to the front, then bring the player back". Coach "Boast, then move into the center and be ready to intercept the return (volley) to length". Well, all of a sudden the tempo of the game changed, the volleyer became the BOSS. A simple phrase can change the game so easily and trigger some positive thoughts. Sam, solo drills in the Library/Drills Routines section, will be a good start. Then pair drills, or feeding drills with a partner would be good as well. Volley ghosting also will help. The racket work needs to be compact, and never hanging down low, as the swing will be too cumbersome, and never "ready" when the ball is near. Here is a Gold video of Zac practising on the backhand from mid-court area, note his balance, and also note his opposite foot forward. Also forehand volley from mid-court. These drills are very good for reflex, and sure sharpen up the eyes and racket work. I've just joined a new club and I was assessed by the coach there and he said I don't volley enough which makes it easy for opponents to control the rally. I try to volley more, but I always feel as if the ball is too far away from me to play a good shot, hence I leave it and play a normal drive. Are there any practices I could use in order to intercept the ball and play more volleys in my game? good stuff Rita, it took me a few years to figure out why i was not volleying. i was hitting everything to the back of the court. I also could not figure out why i was getting so tired, i thought other players were fitter than me, even though i trained harder than them. play long then short and try to follow up with the volley, and watch your opponent struggle and tire very quickly after a few of these combinations. great when it works! I also found that the difference between high graded players and low ones was that the higher graded players volleyed a lot more, and moved the ball around more too while always hunting for the volley. Slavi, racket work is really important for the volley and it highlights any technique problems very quickly. To get the racket back to volley (unless it is very high)or any shot for that matter, you just turn your shoulders (not necessarily your feet)and the racket is back so there is not much time lost in getting the racket in position...you get me? If you do not address the volley with the shoulders turned it is most likely the shot will go cross court - remember "shoulder to the target". 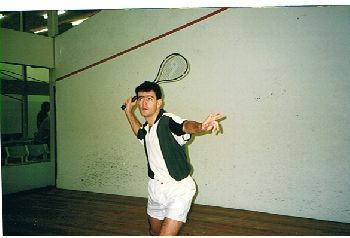 If the ball is hard use the opponent's power, then control the racket head, to get the control of the shot. If you stand front on, and do not turn the shoulders, but try to hit the ball down the line, it will probably be a flat hit (as it is most likely the wrist would have to be turned to get the direction). Wow, there is more, but that is enough for now! I need to see that video for sure. YES YES YES, Volley players rules. They run less and control the game more. Why? Simply, the volley is played at the middle of the court, so they take one or ttwo steps to reach the ball. Sounds easy, nope? But for god sake it is not that easy at all. Good volley, whatever it is, straight or cross court is a very hard shot to learn. And there is a lot of niuances as I've learned. One of the latest discoveries regarding volley - be fast and flexible on your legs, but stay "slow and solid" in your arms. Meaning that the swing of your arm with the racket does not have to be fast, as you'd like to smash the fly. I hope my english is clear enough for you guys. And my latest discovery - DO NOT EVEN TRY to hit the ball in the front of you. AND DO NOT TURN YOUR BODY to strenghten the shot. Stay on your legs as you stood and do not follow the ball right after you hit. Let if go for 0,5 sec. and then move. Well, I do really hope I am understood here.
" So I do ghosting every day after warm up and stretching. And BELIEVE ME, it helps a lot. I do save a lot of energy, running less. "